This sweater is definitely my favorite item I bought for the fall :). It has every quality I appreciate in a cute and cosy autumn sweater. It's grey (obviously! there is no fall without grey sweaters), it's over sized (very important, when trying to drink tea in the evening, wrapped in a blanket), it's super soft and the lace up look is still very fashionable and looks totally adorable. I found this perfect sweater in ZARA and I have to admit I have worn it way too many times. Now on to the cute ankle booties I wear in these pics! I got them as a gift from an online shop called Zaful. I wanted a pair of black ankle booties for fall and when I got this in the mail I got super excited when I tried them on! They are so soft, I feel like I'm wearing slippers :). And they looks so chic paired with black skinny jeans. What do you think? You can find them at THIS link. 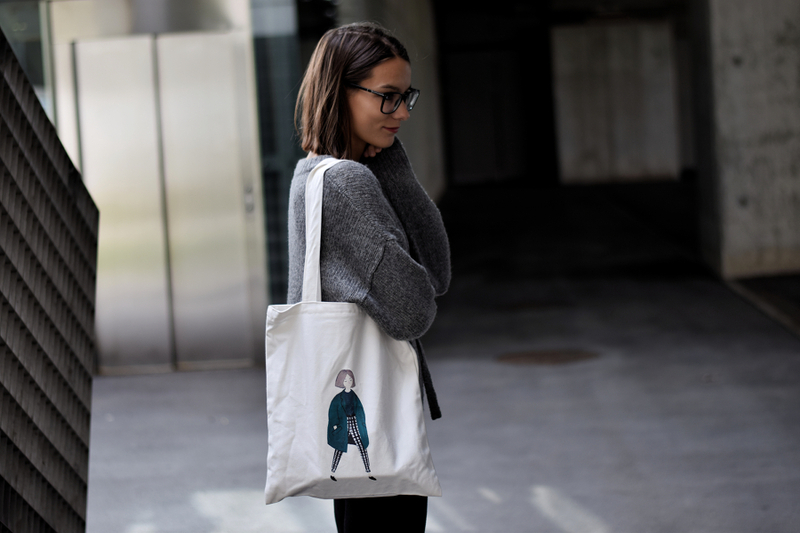 And what do you think about my cute tote bag :)? I love the design on it, the drawing of a girl looks so unique and so fashionable. I got it from SAMMYDRESS on line shop and I absolutely love it! It even has a zipper, which is something I don't often see on tote bags. Unfortunately it's sold out, but you can find lots of cute bags HERE. Follow Sammydress on Facebook. Check out how others wear Sammydress clothing HERE. If you want to keep up with current styles via instagram click HERE.